This line begins and concludes a recent article in Skylight written by Irma Alicia Velásquez Nimatuj, Maya-K’iche’ journalist, activist, and Brown University visiting professor from Guatemala. Professor Nimatuj asks, and answers, why do children leave my country? Armed conflict, loss of loved ones, destruction of resources, natural disasters, and poverty are some of the reasons that push children to leave Guatemala in search of a better life. These children, she explains, seek to break the cycle of poverty into which they were born. Following this piece, she wrote an open letter to President Donald Trump and the government of the United States, explaining the factors that push people out of their homes and their countries. Dr. Nimatuj is an international spokeswoman for Indigenous communities in Central America and was the first Maya-K’iche’ woman to earn a doctorate in social anthropology. Ki’che’ translates to “many trees,” named for the highland mountain valley where the K’iche’ people have resided for over one thousand years, predating the Spanish conquest of Guatemala in 1534 and subsequent colonization. Dr. Nimatuj played a central role in making racial discrimination illegal in Guatemala and is featured in 500 Years, a documentary about Indigenous resistance movements, for her role as an activist and expert witness in war crimes trials. Dr. Nimatuj writes a weekly newspaper column for El Periódico de Guatemala and has served on the UN Commission on the Status of Women, representing Latin America and the Caribbean. This fall, she joined the Watson Institute at Brown, where she teaches courses about Central American history and culture and continues her activism remotely. Conservative discourse in mainstream media portrays immigrants as criminals deceiving US citizens into believing that those who seek asylum are “illegal” and somehow pose a threat. Dr. Nimatuj seeks to center these conversations and debates around asylum seekers and affirm their humanity. While political rhetoric focuses on the consequences of immigration to the US, there is an underlying and often unspoken question: What are the conditions that people are so desperate to escape? The answers to this question are deeply connected to US foreign policy in Central America over the past decades. The Independent met with Dr. Nimatuj to discuss migration patterns to the United States from Central America, Indigenous resistance in Guatemala, and our collective responsibility to young people who are forced to decide between violence at home and a dangerous journey North. Dr. Nimatuj provides an inspiring, critical perspective on the people behind the incisive rhetoric in American media today. The College Hill Independent: You recently wrote an article about unaccompanied children leaving Guatemala and the trauma of state violence. What motivated you to write this piece? Irma Alicia Velásquez Nimatuj: It was the profound indignation and pain I felt seeing kids and young people attempting to cross the border unaccompanied since 2014. The youth in my country have not stopped migrating, despite the long and dangerous journey. Due to the extreme poverty, the increasing violence, the lack of basic needs that our government should provide to all citizens like education, health and housing, migrating is the only option left for entire generations. For a lot of young people, staying in Guatemala means incorporating themselves into organized crime and gangs as the only means of survival. Guatemala is a failed state...Guatemala is a country with high levels of corruption and those in power only support the interest of a small economic and political elite. The Indy: What do you think about the so-called “migrant caravan” and its media coverage in the US? VN: For me, it is not a caravan; it is a humanitarian crisis. Now, this is a humanitarian crisis from many communities. Many Indigenous, many poor people, live in poverty, with no dreams, no possibilities, no options. It’s unacceptable. Because those countries are very rich countries, and they are beautiful countries. The media in the US—they don’t care about Indigenous people. The majority of people here don’t know where Central America is. Now they have a lot of bias about people from Central America, a lot of stereotypes. They don’t know the history, the responsibility of the US, they don’t know what type of government is there. The coverage in the news is very poor. The poverty is caused by the state, and the government is incredibly ignorant of reality. In Central America, the countires of Guatemala, Honduras, and El Salvador are controlled by very few—a political and economic elite. In the case of Guatemala, for example, eight families control the whole country. Twenty families control El Salvador. It is the same in Honduras. It is impossible. They control the land. They control the businesses. They control the education. They control the schools. They control the church. They control the state. They control everything. This is the problem. The Indy: How would you respond to the current anti-immigrant discourse in the US? VN: If the United States wants to stop migration, the country needs to reevaluate its foreign policy. The US needs to reevaluate the way its money is spent so that current and future donations and aid are not lost to corruption. That is why programs centered on reducing poverty cannot be imposed using a foreign or elite vision; they need to be created alongside communities. The way our country is run cannot be conditioned by the policies or decisions of the United States. The Indy: How could this story be told better? VN: To read about the history of US interventions in these countries. This is the best way people can learn about what happened, why people left their communities, their houses, their countries, their families, their sons. You know? This is crazy. For me, this is a humanitarian crisis, and nobody wants to talk about it. The caravan is being used [politically] lightly—only as a fear, a terror. They are bad people, they are delinquent, they have a lot of illnesses. You know? This is not true. The Indy: What steps can we collectively take to improve conditions in Guatemala? VN: We need the Indigenous population to be able to create their own self-sustaining development and not turn them into dependents of political favors or short term social program offers. To achieve this, the government and transnational companies need to stop encroaching on the last of the Indigenous territory to favor mining companies that only leave one percent of royalties in Guatemala. That is why there is so much poverty in Guatemala, because companies are arriving and pilfering the territory and natural resources, leaving behind social conflict. It is ridiculous that a country as rich as Guatemala needs to survive on donations from the international community and that despite this aid, poverty increased eight percent in the last decade. This goes to show that the majority of the aid is not well implemented and only used to increase the riches of a few politicians. The Indy: Do you have any comments on Trump’s recent threat to cut aid to Honduras? VN: Foreign aid is beneficial but not the way it is being used right now. Aid for the militarization of our countries or to fight the war of drugs has not yielded any positive effects for Central America. Instead it has led to more violence and corruption of the militaries, elites and politicians. In Guatemala, military vehicles donated by the United States are used to intimidate the population in the entire country and even to surround and threaten the U.S. embassy in the capital. We don’t need any more of that aid. If Trump cuts foreign aid, I highly doubt that the poorest and most needed communities and people would notice a difference. Central America is currently surviving thanks to the remittances sent from immigrants living abroad. They are the ones who are really providing aid. The Indy: How did you initially become involved in activism, and how does it connect to your work as a scholar and journalist? VN: I was born in a K’iche community that has always been politically active. My community has resisted since 1524 when the Spanish arrived at our territory. During the following three centuries of the colonial era and through independence of Guatemala in 1821, my community managed to maintain a few political spaces and some power. Yet it was not until 1972 that the Indigenous population of my city founded a civic community, called Xel-Ju, and from there fought to win the mayoral elections of my city, finally winning in 1996. This means that I am a product of a long line of my community’s struggle since the Spanish invasion. Being an activist cannot be separated from my academic work because it is my responsibility to use academia to help and contribute to my community and my people. 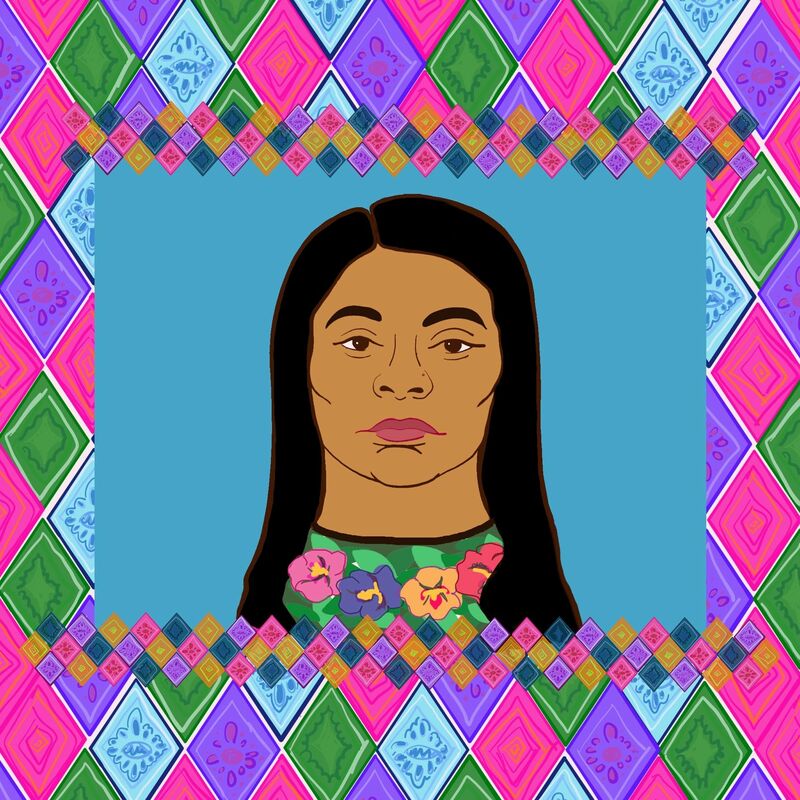 My achievements represent a responsibility to the other generations and to the ongoing processes of Indigenous resistance in Guatemala and Latin America. The Indy: What does it mean to you to be a Maya K’iche’ woman and to hold the position that you hold? VN: In some ways, it’s incredible, you know? But in other ways it is sad for my people. If I think of only me, and my family, probably I can feel that this is incredible. But I am part of a community, so for me it is very hard to have this position and to be here with everything and to think that the majority of my brothers and sisters, especially Indigenous women, live on one or two dollars a day. This is hard. I try to enjoy this part of my life but also every day my history reminds me that I have a lot of responsibility also. I try to teach in the best way that I can to my students the reality of Central America, the reality of Indigenous communities, and that we have a lot of privileges, I have a lot of privileges. So our responsibility is to use all these privileges for justice, for peace, for a better world. To take care of the natural—another type of relation in political, social, and economic ways. I try to use my space, my voice, every time, everywhere, for my people. I try to use this, especially for the most poor, for the people who don’t have these opportunities. Academia needs to be not only in the academy, in academic spaces. We need to break this, and to support and involve other struggles. Not only in Central America, in Africa, but also here, in the United States, a lot of people are living in very bad conditions. The Indy: How do you advocate for native rights in Guatemala, and what does your activism entail? VN: I became a journalist which allowed me to see firsthand the social, political, economic and racial problems of my country. However, I felt that, given the power of the media in my country and its conservative nature, it was almost impossible to problematize the everyday reality of Indigenous people. That is why I felt that I needed to complement my training, and I found the way to do so in activist anthropology. I learned that academia has a responsibility to the communities and people with which we chose to do our research work. As a social activist anthropologist, I use the academic and theoretical tools I learn to carry out research that can be useful to Indigenous communities in my country. Recently I have contributed to several expert witness reports related to processes of transitional justice for the human rights violations committed during Guatemala’s 36-year armed conflict. Even though Indigenous people make up the majority of the population of the country, the political power we hold is minimal. I also try to use my voice in public spaces to denounce the inequalities in which the majority of my people live. Given the racism, poverty and oppression towards Indigenous women in my country, which is controlled by a small elite, I see it as my responsibility to document, analyze and also denounce these multiple oppressions. In Guatemala, eight families control 45 percent of the wealth of the country. This did not happen out of luck, this is a result of nation-states being at the service of elites who historically benefited from the hunger and poverty of the majority. The current ‘migrant crisis’ is a result of past failures from Central American governments but also failed foreign policies of the United States. If we don’t change both, our children and future generations will have to pay for our mistakes. The Indy: What are the different Indigenous groups in Guatemala, and are there connections between them? VN: Guatemala has 24 different Indigenous people, Maya has 22 inside, plus Xinca and Garífuna. We work together since many generations ago. Very long relationship. Why? Because we come from decolonization, decolonization is the same for us. We speak different languages, have different cultures, clothes. But in front of the state, we come from the same decolonization. I continue the job that my parents and grandparents did. Together we share an organization, we share institutions, we travel a lot, we have meetings in different communities. I am a K’iche’, I live next to Mexico, but sometimes I travel to other parts of my country to work with the Garifuna people. The Indy: Have you connected with any Indigenous communities here in the Northeast? VN: I have some friends, some relationships. But it’s hard because for the rest of my sisters and brothers, the language barrier is difficult. We exchange our experiences. We visit universities. I had the opportunity to visit in Canada and US. But the situation is so different in terms of the land. They live in separate spaces and we have our lands. It is very different. We have our Indigenous languages, while they almost lost everything. The relationship is great, important to exchange, but the reality is different. But colonization is the same. The quality of Indigenous education is very bad. The Indians in Guatemala don’t have value for the state. Bilingual education has a low budget, the majority from international support—from the US and Europe, for example. We need more bilingual education in middle school, high school, and even university. The majority of books are in Spanish. It’s crazy—we have 24 Indigenous languages but only one official language, it is Spanish. This is part of decolonization. The Indy: What type of work will you do after this year? VN: I’m working with Indigenous communities, Indigenous organizations in different parts of Guatemala and Central and South America. I have a very strong relationship with many Indigenous leaders around Latin America. We are working for our rights—social, economic, and political. The population of Guatemala is 17 million people. We are around 10 million Indigenous people but we don’t have political power. It is like South Africa. So we don’t have political power; we are working for political power. VN: I would like to add something to the students: I went to university in the middle of the Civil War in my country. I survived—I don’t know how I survived. Because a lot of Indigenous students, a lot of my professors were killed, were disappeared. And many of them are still disappeared. Many of them left the country, they field to different places—US, Canada, Mexico, Europe. For me, to go to university in the middle of the Civil War, also was the opportunity to understand my country, to understand what is the history of us. But also to understand that if we survive, we have responsibilities. I survived, and I would like to say to students that they have a lot of opportunities here. They have everything. You don’t need anything from other spaces. You have libraries, you have the best professors, you have the best courses, the best campus. So use it; use it to change the world. Use all this knowledge for building other possibilities, other ways, another world. Not only for you but for the rest of the world. If you want peace, if you want security, you need to demand the same for the rest of the youth. JESSICA MURPHY B’19 wants you to learn more about indigenous women’s resistance in Guatemala at 12pm, Monday 11/12 at the Watson Institute: https://watson.brown.edu/events/2018/irma-velasquez-nimatuj-justice-beyond-final-verdict-role-court-ordered-reparations.